1897-1898: Pinehurst’s first golf course, a nine-hole, primitive set of links, is laid out by Dr. D. LeRoy Culver, an amateur designer. 1898: When the first Pinehurst clubhouse is completed, it contains dressing rooms for both ladies and gentlemen, reflecting the interest in golf by both sexes. 1900: English pro and world champion Harry Vardon plays an exhibition match on the resort’s 18-hole course, bolstering Pinehurt’s reputation among a growing number of golf enthusiasts. 1900: Scots-born golf pro Donald Ross comes to Pinehurst in December for what will be a 48-year stay. The Pinehurst Outlook reports golf "is rolling over the country like a great tidal wave and gaining power as it advances... The royal and ancient game furnishes ideal recreation for old and young of both sexes, and it has evidently come to stay..."
1901: Pinehurst hosts the first North & South Men’s Amateur. According to Richard Tufts’ book, The Scottish Invasion, the tournament’s original title was the "United North and South Championship," designed to convey a union of the North and South. Future winners would include Francis Ouimet, Frank Stranahan, Harvie Ward, William C. Campbell, Billy Joe Patton, Jack Nicklaus, Curtis Strange, Gary Hallberg, Hal Sutton, Corey Pavin, Davis Love III, and Billy Andrade. 1902: The first North and South Open is played in Pinehurst. Golf legends Ben Hogan and Sam Snead are among the winners in its 49-year history, as well as three-time winner Donald Ross. 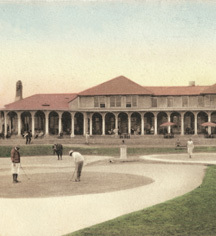 1907: Donald Ross completes design and construction of Pinehurst No. 2. The course is designed as a “championship course” and is heralded by professionals and lovers of the game. 1936: Pinehurst hosts the PGA Championship on Pinehurst No. 2, after its sand greens are replaced with grass. Danny Shute emerges victorious on the newly renovated course. 1951: Ryder Cup Matches are held on Pinehurst No. 2. The United States defeats Great Britain with a final score of 9½ to 2½. The North and South Open holds its final tournament at Pinehurst. 1962: US Men’s Amateur Championship played at Pinehurst. Labron Harris is declared the winner. 1995: Pinehurst celebrates its 100th birthday with an array of activities. The Centennial Course – Pinehurst No. 8 – begins construction for Tom Fazio’s design. 1997: In March of 1997, Pinehurst No. 2 reopened following a nine month shut down for improvements. Greens were rebuilt and seeded with a more heat tolerant bent grass – Penn G-2. Rees Jones consulted on the project, which included expanding the greens and bunker restoration. 1999: In its 99th year, the Men’s US Open is played on the classic fairways and greens of Pinehurst No. 2 with an exciting finish on the 18th green to leave Payne Stewart as the victor. 2000: Pinehurst celebrates the 100th North & South Men’s Amateur Championship and past winners, including Davis Love III, Jack Nicklaus, Curtis Strange. 2001: Pinehurst celebrates 50th Anniversary of the North & South Senior Men’s Championship and past winners. Pinehurst also anticipates unveiling of Payne Stewart Memorial in the Tufts Garden, near Pinehurst No. 2’s 18th green. 2002: Pinehurst celebrates 100th North & South Women’s Amateur Championship and the 45th Senior Women’s North and South Amateur Championship, and past winners, including Maureen Orcutt and Peggy Kirk. 2005: US Open Championship returned to Pinehurst June 16-19, 2005. Michael Campbell of New Zealand wins with an even par score for the championship over 2nd place finisher, Tiger Woods. 2007: Pinehurst celebrates 100 years of championship golf with the Centennial Celebration of Pinehurst No. 2. 2011: In February 2010, Pinehurst contracted with the design firm of Coore & Crenshaw, Inc., to restore the legendary No. 2 golf course with natural and strategic characteristics that were the essence of Ross’ original design. 2014: Pinehurst will host 14 days of championship play in 2014, with back-to-back US Open and US Women’s Open Championships for the first time in their history. 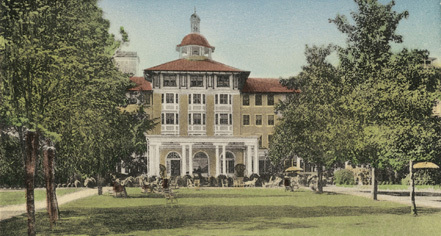 Pinehurst Resort, a member of Historic Hotels of America since 1991, dates back to 1895. Read more about the history of the Pinehurst Resort, as told by Historic Hotels of America 2014 and 2015 Historian of the Year Stanley Turkel. Excerpt is taken from his latest book Built to Last: 100+ Year-Old Hotels East of the Mississippi (AuthorHouse 2013).